Being the palette addict that I am, I will begin with two palettes - one cheek and one eye but both from Too Faced. The more I try from Too Faced, the more I love. The quality and pigmentation of their products is right up there with Urban Decay and MAC but the texture is probably my favourite of any brand I have used - everything is just so buttery soft and so easy to blend. 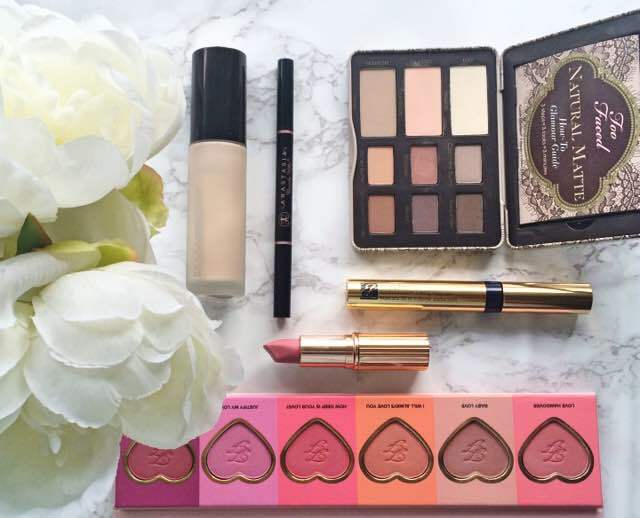 At the beginning of the year I bought Too Faced Natural Matte Eyeshadow Palette after seeing in on Sal's blog. I had thought about buying the Too Faced Natural Eye Shadow Collection but thought that it was too similar to other palettes that I already owned, but when I saw that this palette had only matte shadows, I knew that it had to be mine! There are 9 shadows in total - three large and six minis, all of which are equal in quality and there is also a step by step guide on how to create looks. Although some matte shadows can be chalky/patchy/drying, that is not the case at all with this palette. There is a mixture of cool, warm and neutral shadows (similar to Kat Von D Shade & Light Eye Contour palette) and I think that if you don't own any matte shadows and are not a palette addict like I am, then this would have your completely covered for both day and night, neutral and smokey eyes. I much prefer it to the Naked Basics palette, which I never use. The second palette is a blush palette, however it was limited edition but I will link to the individual blushes here in case any catch your eye. It is the Too Faced Love Flush Long-Lasting 16 Hour Blush Wardrobe. This contains a mini of each of the six Too Faced blushes and I was so delighted to get my hands on it because I had wanted to buy one of the blushes but couldn't decide which one. There is a blush for every look in here and all of them are incredible in terms of pigmentation and staying power. I will definitely be purchasing full sizes of some of them when I hit pan - I particularly love Love Hangover and I Will Always Love you but it's brilliant to have blush colours in there that I wouldn't normally wear like Justify My Love and Your Love is King. BECCA Backlight Priming Filter is, without doubt, one of my favourite discoveries this year. If you like glowing skin that doesn't look sweaty, then you need this in your life! This instantly transforms the skin without giving a discoball effect and doesn't accentuate pores or fine lines. If you have a foundation that you feel looks a little flat (like Estée Lauder Double Wear or Chanel Les Beiges), this will transform it. It really helps to disguise the signs of fatigue too if you need help in that area (I think we all do at times!) and it doesn't feel greasy on the skin. An all round winner in my books! Long time readers will know that my all time favourite mascara is YSL Faux Cils but I have found one to rival that: Estée Lauder Bold Volume Lifting Mascara. I like a lot of volume in my lashes, rather than definition or length (if I can get those too, that's a bonus!) but volume is what I want and this mascara gives me just that. It also ticks my other boxes: very black, non-smudging, non-flakey and doesn't make my lashes feel crispy! I was a huge fan of the Anastasia Beverly Hills Brow Wiz but I prefer their Brow Definer now. I find that I can do my brows much faster when I use this product and like that it is angled so that I can add shape without taking too long. It also contains a lot more product for the price compared to the Brow Wiz. When Charlotte Tilbury released two new lipsticks earlier this year, I had to buy them both! I thought that I would wear Kiss Chase most but have found that I reach for Between The Sheets more often. It is perfect for everyday wear if you like pink lips and the creamy formula is so comfortable to wear, despite it being a matte lipstick. I am very excited about her upcoming new lipstick releases this summer - so many new shades & a donation to charity from each sale - it would be rude not buy at least one!! So that's the end of my favourite makeup discoveries so far this year - I will do another post at the end of the year, which will no doubt feature some of my Sephora purchases but there are some upcoming releases that I am excited about and I am dying to get my hands on some Natasha Denona products so I am delighted that Beauty Bay will be stocking them later this week! I will also do a skincare/perfume/miscellaneous post of this kind soon. I would love to hear what discoveries you have made this year? Please tell me in the comments below!